An influential Sudanese imam had to be removed from a mosque in the capital, Khartoum, after worshippers confronted him for not leading protests against embattled President Omar al-Bashir. In a video shared on social media, a man appears to shout at imam Abdul Hai Yusuf, who often backs the government: "Get up and lead us from this mosque!" A frantic crowd then chants "downfall [of the regime] only". Police fired tear gas at protesters who marched after Friday prayers. Three weeks of demonstrations have left 22 people dead across the country. The protests, initially against the rising cost of fuel and bread, have morphed to calls for Mr Bashir to step down to end his 30-year rule. A video shared on Facebook appears to show a member of the Khatim al-Mursaleen mosque challenging Mr Yusuf, a Saudi-educated imam. Mr Yusuf, who is known for encouraging his followers to march in solidarity with Gaza or Syria, had to be whisked from a door near the pulpit. He has previously appealed to the government to exercise restraint in the current unrest. Another video shows crowds chanting outside the mosque. |#رصد |#السودان |#الخرطوم #مدن_السودان_تنتفض #تسقط_بس #جبره | هتغات المصلين عقب صلاة الجمعة #تسقط_بس . The authenticity of the videos could not be immediately verified. 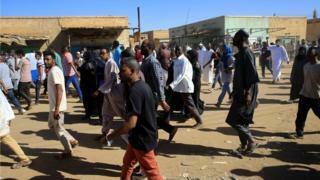 Friday's protests in Khartoum and nearby Omdurman appeared to draw more people than before and were more widespread, Reuters news agency reports. Security forces chased the demonstrators but there were no immediate reports of casualties. Three-quarters of Sudan's oil income was lost after the country's southern half voted to secede in 2011, leading to the formation of South Sudan.